"Prosperity doesn’t mean that you will have wealth, health and happiness. The best way to explain prosperity is to say it is like when a rosebud flowers and opens up, and it shares its fragrance. That’s the moment, which lasts a few days, when a rose flower is prosperous. When a man or woman is prosperous, it is the fragrance of security, grace, depth, character, and truthfulness that a person can share. Like a candle emits light, a human emits prosperity." Yet when we clear the mind through meditation – something wonderful happens. The light of the soul starts to shine. And as the Inner Self becomes more prominent, a change takes place in a person. Their fears depart. Joy comes in. And rather than being pushed and pulled by the environments around her, a person can settle into a place of living according to her inner truth. This strength to live according to one’s inner voice with grace and dignity doesn’t simply “attract” prosperity. It creates it. We can see so many examples throughout history of people who challenged the time and space they lived in. They made a decision to live in the integrity of their own consciousness. Even though they met with challenges along the way, the very act of staying true to themselves eventually made them victorious. It also opened up opportunities for other people. Whether it is the communications vision of Steven Jobs at Apple or the fight for political equality personified in the life of Nelson Mandela – all those who have created a legacy have done so because they lived committed to their deepest, most genuine self. In the teachings of the Siri Singh Sahib – Yogi Bhajan – it is this consciousness of finding and staying true to that deep, spiritual self which is the real source of prosperity. Our spiritual practice gives us a chance to live according to our soul. The purer our minds become, the more the light of the soul shines. The stronger the light becomes, the more we create for ourselves and for others. The power of attraction does not come from what we want. It comes from who we are. And when we can tap into and live in our Divine Self – the entire universe longs to come close. In the weeks and months ahead, it will be my privilege and blessing to continue sharing excerpts and commentary on a new book being published by KRI titled Success and the Spirit: An Aquarian Path to Abundance. The book includes lectures, shabads, and Kundalini Yoga meditations taught by Yogi Bhajan on how to experience success at the deepest level of your being and how to leave a living legacy on the earth. I look forward to the conversation that these columns will create with you. 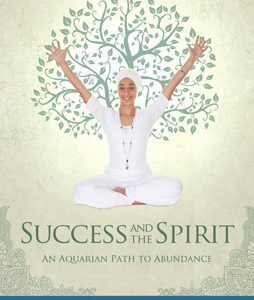 Success and the Spirit: An Aquarian Path to Abundance contains the wisdom and teachings of Sikh Dharma and Kundalini yoga as taught by the Siri Singh Sahib, Yogi Bhajan. The book will be released during 3HO’s Summer Solstice in 2011. This article originally appeared on the Spirit Voyage Blog. Great insight about the concept of " Prosperity". Thanks Ek Ong Kar for this wonderful article. BTW – Missed reading your brilliant,apt and so meaningful articles after such a long gap of time . God Bless . wonderfull article. you are right the real prosperity lies within us. the more we explore ourself, faster we'll reach home and all struggles will start leaving us. The human being really can emit a beautiful and natural fragrance without any perfumes or market products. Sounds like impossible? But it's true. The path of light can give us that and much more. Beautiful fragrances in the soul, with our actions, emotions, thoughts cleaned, our physical body becomes cleaned, too. We need purification in all our bodies. We need to be universal love. We need to transmute our Karma and be opened to the truth. Being more and more spiritual, our hormones become different.